Miami Beach, December 2013... While winter moves into the northern hemisphere, the big names in art are basking in the warmth preceding Art Basel, now a key stage in the race to the top contemporary art fairs. For Brussels gallery owner Rodolphe Janssens, "Art Basel Miami Beach is the number one fair in the US, because of the international quality of its collectors from not only America but also Europe and the Middle East. After Basel itself, it is the second best fair in the world." Some, like Kamel Mennour, have opted for Miami and abandoned New York's Armory Show, now less favourable than the Florida fair, which started up in 2002. Loyal to both events, Janssens says, "For me, Miami provides an opportunity to meet the top collectors from all over the US, and not just from New York, which is the case with Frieze and the Armory Show." And with an estimated £1.5 millions' worth of transactions, as the Guardian announced in December 2012, the financial potential of Art Basel Miami Beach is staggering. Has France become the new Eldorado for collectors of Amerindian art? For a good ten years now, the speciality has been a key player in the success of the Paris market. We remember the Jenny Keifts and Thery-Atcchevinsly sales in December 2002 and March 2003 respectively, the memorable sale of the André Breton collection in April 2003, and that of the Robert Lebel collection three years later, again in Paris. During his years of exile in the US, Breton became friends with one Claude Lévi-Strauss, who, like him, was a regular visitor to 943 Third Avenue in New York: the store of antiques dealer Julius Carlebach. This was where the two men, Robert Lebel and the Surrealist artists would stock up with Indian objects. The Lévi-Strauss sale at Drouot in June 1951 was the first of its kind. This acronym conceals a collection, itself transformed into a work of art with a universal resonance, inspired by events in the intimate story of a couple. 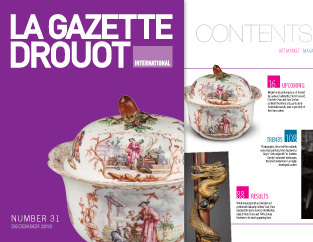 La Gazette Drouot. 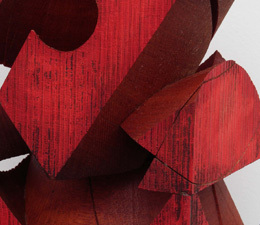 Your contemporary art collection, being shown for the first time in Europe, is exhibited in a very singular way. Why? Guillaume Lévy-Lambert. My companion Mark Goh and I have created a collection that tells our story. We were in Phuket on 26 December 2004, and were lucky enough to find ourselves on an islet that was relatively untouched by the tsunami. But it made us realise how frail life is, and how important it was to pass on our collection. I first of all had the idea of a book, which then became the project called MaGMA, standing for "Mark and Guillaume Museum of Art". As part of the finance act, French députés (members of parliament) were planning to raise VAT on imported art works from 7% to 10%. This measure raised such an outcry in the world of the art market that a white paper – drafted by professionals and specialists in the matter (Jacques Fingerhut and Clare McAndrew) – was commissioned in France by the Syndicat National des Maisons de Ventes, the Comité Professionnel des Galeries d’Art, the Syndicat National des Antiquaires, the gallery owner Franck Prazan and the Chairman of Sotheby’s France, Guillaume Cerutti. In the end, the député Christian Eckert, General Rapporteur for the finance commission, proposed an amendment to the finance act whereby VAT on imports would be set at 5.5%, i.e. the rate in force before VAT was raised to 7%.